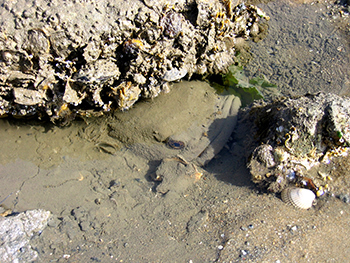 During the breeding season, male Lusitanian toadfish, such as the one shown here (under the rock, in the mud), will build their nests under rocks in shallow waters. They attract females by producing a characteristic advertisement call, which sounds like a boat whistle. Image courtesy of: Clara Amorim. Lusitanian toadfish, Halobatrachus didactylus, are found in waters along the tropical Western African coast to the Mediterranean Sea and the Atlantic shore of the Portugal and Spain. Their habitat consists of shallow coastal zones and estuaries (up to 50 m depth). During the breeding season (May to July), male Lusitanian toadfish build nests under rocks in shallow water. To attract females to their nests, the males produce pulsed, boat whistle vocalizations that last approximately 0.8 seconds and have a fundamental frequency of approximately 60 Hz. The call has three segments characterized by different durations, pulse periods, amplitude, and dominant frequencies. The Lusitanian toadfish produce these sounds by contracting the sonic muscles on each side of their swim bladder. Males will vocalize alone or with other fish in a chorus. Lusitanian toadfish optimize their calling effort, and will adjust their calling rate in response to a neighbor’s calling activity. Males calling alone will call at low rates, but males chorusing together call at higher rates and for a longer duration. Lusitanian toadfish display an extensive acoustic repertoire. Along with the low-frequency mating calls, male Lusitanian toadfish also produce “short grunt” and “double-croak” sounds, which are mainly associated with nest defense and aggressive encounters with other males. The male toadfish also produce a lower frequency, lower amplitude boatwhistle call during nest defense. This call functions as a “keep-out” signal. Boatwhistle calls are distinct between individuals. Scientists have found correlations between steroid levels, lipid levels, and/or the mass and length of individual male Lusitanian toadfish, and the spectral content of their vocalizations. This suggests that the certain characteristics of these acoustic signals are intended to notify females, as well as potential nest intruders, of the calling male’s size, quality, condition, and/or capability of nest defense. Males with good body condition will be able to call longer and at higher rates. Sounds and acoustic behavior of Lustianian toadfish is similar to that of the oyster toadfish and plainfin midshipman.